This tempura-style cauliflower is made extra flavorful by the additions of garlic, parsley and Moroccan spices to the batter. Similar although less zesty treatment is given to Moroccan fried eggplant. The recipe calls for partially cooking the cauliflower florets before frying them, but for a firmer texture, you can skip that step. 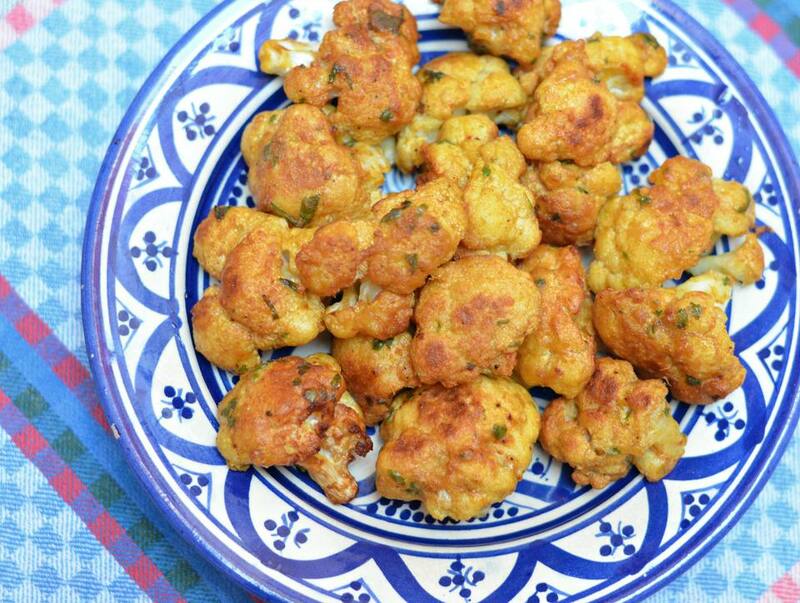 Serve the fried cauliflower as an accompaniment to almost any Moroccan meal. Break the head of cauliflower into bite-sized florets. Wash, drain, and partially boil or steam (covered) for two to three minutes. Be careful not to overcook; you want the cauliflower to still be firm with a crisp-tender bite. Drain. In a large bowl, beat the eggs. Whisk in the water and then whisk in the flour until smooth. Add the garlic, parsley, cumin, paprika, salt, and cayenne pepper. Whisk to blend in smoothly. Transfer the cauliflower florets to the bowl. Toss (simply pick up the bowl and shake carefully) or stir gently until the cauliflower florets are evenly coated with batter. Line a large baking sheet with paper towels. You can either shallow fry or deep fry the cauliflower in batches. Heat about 1/4 inch (.5 cm) of vegetable oil in a large skillet over medium heat until hot. Transfer some of the coated cauliflower florets to the hot oil; do not crowd. Cook for several minutes then turn over with spoons or forks to cook the other side, again for several minutes, until deep golden. Remove the cooked cauliflower with a slotted spoon to the paper-towel-lined pan to drain. Repeat with the remaining cauliflower. Heat two inches (5 cm) of vegetable oil in a wide pot over medium heat until hot. (Test by dropping in a small floret; the oil should immediately bubble). Add the cauliflower and cook in batches; do not crowd the florets in the oil. Cook each batch for about 5 minutes or until deep golden in color, turning larger pieces once or twice if necessary. Remove the cooked cauliflower with a slotted spoon to the paper towel-lined pan to drain and repeat with the remaining cauliflower. The cauliflower can be cooked a little ahead of time and held warm in a 250 F (120/130 C) oven. Or, if cooking well in advance, the cauliflower can be reheated in a preheated 400 F (200 C) oven for 5 to 10 minutes. Serve the fried cauliflower as-is or with a dipping sauce. My family likes them with mayonnaise and lemon wedges on the side.